Dogs are social creatures. In addition to spending time with their human family members, pups also like to socialize with other dogs. Dog parks provide the perfect venue for pooches to play and exercise with other dogs in a safe and controlled setting. However, introducing a puppy to the dog park scene might cause a pet owner some anxiety. How do you keep your puppy safe in this new environment full of other canines? Puppies present a unique set of challenges to their owners when being introduced to dog parks. Puppies generally are more active and curious than adult canines which could lead to more conflict with other dogs; however, with caution and preparation, puppies can enjoy dog parks while learning important social interaction skills. To start off, puppies younger than 4 months old shouldn't be brought to the dog park. They have not been fully immunized and will be susceptible to catching diseases from other dogs. If an older dog displays aggressive behavior towards him, your puppy could be traumatized during a very important stage of his social development. But once your dog is fully immunized and ready to be around new dogs, visits to the dog park will help him to develop good etiquette for healthy interaction with his fellow canines. The key to keeping your active puppy safe at the dog park is to have a good grasp on how your dog will respond to other dogs. 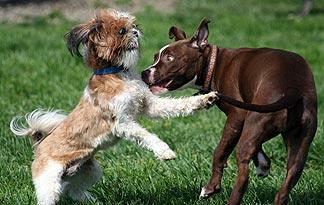 Before taking your puppy to the dog park, test how your dog will react to meeting a new canine friend. Introduce your puppy to a friend or neighbor's dog to gauge how he'll react. Next, we'll take a look at some more useful tips for keeping your romping bundle of fur safe once he gets to the dog park. Before you take your dog to the dog park, consider checking out the park solo so that you can see how the other dogs behave and interact with each other. If the dogs seem to play too rough for your dog, visit another dog park. If the dog park seems to match your puppy's level of activeness, bring him to the park and let him observe from the outside. Watching his reactions to the other dogs will give you an idea of how he'll act in response to actual interaction with the other dogs. Once you've prepped your dog to enter the dog park, start off in a cautious manner. Evenings during the week, holidays, and weekends tend to be busy times for dog parks, so it's best to introduce your dog to the park when there's not a big canine crowd. Walk your dog before you take him to the dog park so that he's not too wound up with energy. Keep your first visit short so as not to overwhelm your puppy. Start out with a 15-minute visit, and slowly increase the length of your stay. Once you've entered the unleashed area of the dog park, be sure to let your dog off his leash. Mixing unleashed and leashed dogs can create a hostile environment. Leashed dogs and their owners can display body language that might be perceived by unleashed dogs as threatening, causing the unleashed dogs to act in an aggressive manner. Also, don't bring treats or toys to the dog park. Rewards and snacks might create jealousy and aggression between puppies. Once your puppy is acclimated to the dog park scene, you still have to be vigilant about supervising him. Watch him closely when he's interacting with other dogs; keep an eye on both his body language and the body language of other canines. If he starts to become fearful or aggressive, it's time to leave the park. But with a little forethought and preparation, an active puppy will have a safe and rewarding dog park experience.